Hello everyone, it's Gail here blogging today! I hope you're having a great week! I have to admit, I let out a squeal of delight when my delivery man dropped off a box full of the newest lines from Simple Stories! I have been dying to play with Vintage Bliss so I dove right in! Now you know I've gone on before about how much I love the 6" paper pads, well this layout utilizes them perfectly! I was inspired by a handmade quilt I saw on a blog recently here. I gathered several sheets of the 6" paper (the smaller designs are perfect for the smaller blocks) and cut lots of triangles. I wasn't too exact when cutting them. I made a triangle template from some chipboard and simply traced around it and cut them all out. My triangles' sides are about 2.5". Next I layed them out on my backgorund cardstock until I was happy with the design and then slowly distressed the edges of each and adhered them down. I was very happy with my background and had loads of fun then adding my photos and embellishments! A lot of the elements on my layout were raised on pop dots so as to preserve the dimension that I carefully created with my background. In my usual Simple Stories style, I layered up lots of stickers to create my embellishment clusters. Thank you for visiting today and I hope I've inspired you to get out those 6" paper pads and get patchworking . . . scrapbooking style! Today I'm here to share with you a page made with my very favorite Simple Stories collection, Urban Traveler. I've been saving my travel photos for just the right line and this is it, my friends! I based this layout on the Go. See. Do. border strip, which is probably my favorite element from this collection. I also included some of my favorite prints, like the arrows from Jet Set #2906 and some bright papers from the Urban Traveler Simple Basics. Simple Stories has also added a lot of great new embellishments to all three new releases, like brads! This airplane is part of the set- isn't it cute? I used a few stickers from the Fundamentals Cardstock Sticker sheet like this luggage tag, and I also added some jute for texture. You'll definitely be seeing a lot more travel pages with this line from me in the coming months! Hello All! Wendy here to share up an altered project for you today! I always love the vintage and eclectic and this printer's tray from 7 Gypsies just spoke to me along with the Simple Stories Take a Hike collection. I love the tone of the distressed tray along with the color palette in this collection. My soul screamed...a perfect pairing. Truth. Take a Hike is a previous release from Simple Stories and just about perfection for all things outdoor-sy, masculine, and "simply" capturing the beauty of nature. You can still grab it up at your fav online spots for scrapbook product and/or local scrapbook store. So, in this project I wanted to capture his love for the outdoors, skiing, hiking, the beautiful mountains of Salzburg, Austria, bringing in the rustic, all along with the beautiful scenes of nature in his part of the world. I went with black & white photos for uniformity and to keep the photos as a key piece to the project. I wanted to keep many of the cubby holes in the tray just the natural wood and only used about 2-3 colors of pattern paper and/or patterns not so 'busy' to keep the tray from being 'overwhelmed'. Also, in using the 6x6 paper pad from the Take a Hike collection, the patterns are smaller in scale than the 12x12 size and I love this for working with mini projects and altered projects. If you didn't know that...daily food for thought. Ha! Without further ado..."One with Nature"
I played on the scenes you find in nature...the mini fawn was found in the children's toys section of a store. The fishing embellishments are actually dollhouse miniatures. The trees are from train track landscape scenery. These simple touches added just the punch to my project that I was looking to capture. Randomly thinking "out-of-the-box" brought a lot of interest, texture, movement, and just the random to my project, "One with Nature". I love to cover multiple sections with one photo cut to size of the tray pockets. This adds a neat and unexpected interest to the project. I love the mixing of different tones of wood and metal - i.e. wood veneer shapes, metal vintage finds, metal quote plaques, and mini wood letters. Also, this would make an excellent birthday gift for hubby, boyfriend, male friend or a great Father's Day gift that can be displayed! Letterblock Printer's Tray - 7 Gypsies, Trees - Woodland Classics - Woodland Scenics Forever Green #TR3565 N, HO, O Scale, Fishing Accessories & Rabbit - Mayberry Street Miniatures, Wood Veneer Shapes - Studio Calico (birds, letters, bicycle), Fawn - Safari Ltd, Metal Phrase Plaque & Hanging Screw - Advantus - Tim Holtz, Metal Dome Studs - 7 Gypsies, zGlossy Accents - Ranger, Glue Dots - Glue Arts - Extreme Tac Adhesive Squares, Mod Podge - Matte, Metal Wheel - Local Vintage Store. I love to create mini albums. When I first saw the Urban Traveler collection, I just KNEW that I had to create a fun mini album to store some travel photos in. I love to travel so this collection is right up my alley! The colors are so much fun, I am in love with all of the bright colors in all of the new collections! They simply make me happy. I love that this collection can be used for a boy or a girl, the theme itself is so universal. Simple Stories has done a fabulous job with this! I have a feeling it will be a big hit, especially for summer travel projects! Hi all of you Simple Stories fans! Tonya here today to share with you a new layout featuring Vintage Bliss. When I first saw this photo of my little girl I immediately thought of this line...the pinks were a perfect match! I chose to cut up the 12x12 sheet of 3x4 Journaling Card Elements and then picked the ones that I felt would tie in best with my theme and photo. I then stitched these together using a zig zag stitch. Lastly I created a sunshine with that awesome yellow graph paper. Embellished it with some hand stitching, a few sequins, and a title. I also thought I would share a layout with you that I did for the Clear Scraps blog....it features Harvest Lane! I used my Came to cut the title and conjoined hearts. I love the effect of clear acrylic poking through on a layout. Thank you for stoppin by today!!!! Hi everyone! Today I get to share with you a few recent cards I've created using the three new collections from Simple Stories. There is so much to love about each of these collections...no way I could ever, ever pick a favorite. These first two cards use the new Vintage Bliss collection. I love the shabby, worn, weathered wood grain images mixed with the sweet pastels and florals. So playful, whimsical and so much fun to use. The new 24/Seven collection has my heart I tell you....I can't get enough of the cork and ephemera, the tweed and honeycomb....lots to love and I love it all :). Last but certainly not least are a couple of cards using the new Urban Traveler collection. It's a dream...maps, vintage tickets and ephemera mixed in with bright and trendy colors and patterns. A little something for everyone. You'll love diving in and creating with each of these collections. It seems pretty obvious lately that Simple Stories lines can go beyond their use with divided page protectors. I'd been spending a lot of my scrappy time of late playing with the divided page protectors, it was time to return to some of my well-loved, traditional scrapping. A couple of years ago, my son and I took our four dogs out hiking in northern Arizona. I realized I had several photos I hadn't yet scrapped. Couple that with the Take a Hike line sitting on my table, and I considered it kismet! I started with the main photo, the subtle yellow chevron paper, a solid slate background paper, and the alpha/word sticker sheet. I also wanted the map imagery (a Simple Stories/Unity Stamp cobrand item) on my layout somewhere so I stamped it onto the journaling block before writing up my thoughts. I stamped the image in a circle shape by punching a circle shape into some printer paper (you want a really thin paper as a mask) and then stamped within the circle. I put the title on one side with those GORGEOUS woodgrain alphas. And the orange type alphas are the perfect size for augmenting a title or creating a subtitle. On the other side, I put the date and a sticker from the icon sheet... and ironically enough, my son featured in the photos is actually wilderness certified. I topped the layout off with a border of coordinating patterns, some map paper, and a few scraps. I'm thrilled with the masculine feel of the layout, and I'm excited to have another set of our outdoor adventure photos scrapped. I still have plenty more, so thank goodness the Take a Hike line offers me so many options for scrapping them. So, what are you waiting for? Get off the couch, enjoy an adventure, then grab some Simple Stories and scrap it. Hi all! Kay here with a week of Project Life using the amazing 24/Seven Collection. I think I could use this every week. The colors with the graphics = AMAZING. Here is a close-up of the left side. And the fact that you can add so little to have so much impact . . . I know you will love this line for your PL spreads as well! Now that February is coming to an end, it's time to make plans for a festive spring. Easter will be here before you know it and that anticipated egg hunt is on the horizon. The Sn@p Life collection is such a great palette for everyday events AND special occasions like Easter. I love how the bright colors enhanced this fun photo of my daughter collecting Easter eggs. I used the Sn@p 6x6 paper pad to cut all of these little banners and then added the days of the week stickers with some foam tape to make them pop. It's such a fun design element and compliments the single 5 x 7 photo. I LOVE this sentiment! Perfect for the expression on my daughter's face and really ties all of the little banners together with the title Hello Happy. Added some twine, clear cut shapes and chipboard to finish off the look. 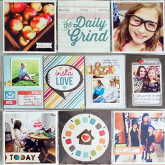 AND...check out the new Spring Issue of Scrapbooking and Beyond Magazine for more fun spring layouts. It hits the newsstand on February 24th. These tags were made from the NEW Vintage Bliss collection. I love the weathered wood patterned paper as the background and chose elements to compliment the look.